I know for a fact that some friends of mine would consider me a film snob. I went to film school, I have migrated to TV but still work in “the biz”. In high school I already owned my own copies of Fellini films and had ingested everything from Citizen Kane to Porky’s. I also know from guilty pleasures. I was a horror film geek. I’ve been to Fangoria conventions. I made my own slasher films with friends. I immediately went to horror when I thought of this post because keeping my love of total schlock hidden during college while we watched The Bicycle Thief yet again became imperative if I wanted to escape ridicule. In other words, I absolutely felt guilty. But no. I had a group of people to whom I could be open about my love of horror movies. I needed something that I kept from everyone. A real confessional. I thought about all those movies I love that the conventional wisdom says are bad. I had to reconsider again, though, because I am steadfast in my love of Joe Vs. The Volcano, Real Genius and the fact that Radio Days is my favorite Woody Allen movie. I’ll shout it from the rooftops and if you don’t like those movies: screw you. No, I had to dig deeper into parts of myself I denied. I had to find a film that made me feel truly guilty. And I found one. I don’t feel guilty just around other people, I even feel guilty when I think of it alone. I give myself a guilt trip. There. I said it. 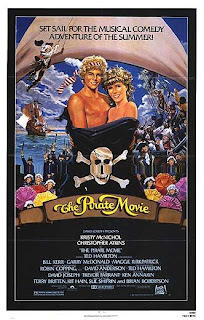 I like The Pirate Movie, a musical with Kristy McNichol and Christopher Atkins. A Rock n Roll update of The Pirates of Penzance shot in Australia and featuring humor that the ten-year-old me found quite saucy. And therein lies my love for the movie. I was ten when I saw it in a theater. Twice. I’ll say that again – I went to see The Pirate Movie, liked it so much I went back and saw it again. By myself. Oh, and I had to ride my bike to the theater about 5 miles away for the pleasure. You see, when I was eleven I started going to visit my mother for two weeks in the summer (they divorced when I was around 4). That summer she lived in Des Moines, Iowa and I was alone all day while she and my stepdad went to work. I had a bike and directions to a movie theater but wasn’t allowed to see anything rated R. Based on the poster my Mom wouldn’t let me see Meatballs either, which quite dismayed me. Guess what? Love that one too. Wanna fight about it? I think that for most movies we know are terrible but we like anyway, it has everything to do with the circumstances under which we first saw them. If I had seen The Pirate Movie in college between screenings of Italian Neo-realist films and the origins of modern montage in Russian constructionist cinema, would I have liked it? No way in hell. And again, I know it is bad. All kinds of bad. Ten flavors combined in a secret recipe of bad they invented just for that movie and then locked away the formula. But at eleven, bored in a strange town in Iowa during a humid summer where every movie’s star quotient was raised three stars just for the air conditioning, I fell in love with this scrappy movie with the catchy 80’s tunes and a cute-as-a-button Kristy McNichol as a character named Mabel. Years later my dog is named Maybel. Did we name her after the film? No. That’s what I tell my wife anyway. Take a film like the above mentioned Joe Vs. The Volcano. I saw that movie alone, in my early 20s, at a time when I was ripe for the messages of self-discovery and carpe diem sensibilities. I also think it is very well directed and that Meg Ryan has never been better. On this point the world seems to be coming around. But the time and place I experienced that film was what made it an all-time favorite of mine. As a father of two now I get to experience the magic of movies through their eyes. In my own movie-watching life I’ve peeked behind the curtain. I’ve been to the slaughterhouse and seen how the sausage is made. I’ve seen too many films of all stripes for anything to have that kind of impact on me anymore. It is incredibly rare for any film to transport me to another place and time (even 1800’s Australia) and I lament the passing of those magical years. Watching a film like The Pirate Movie again brings back a glimmer of that joy. I’m not watching the film and enjoying the performances, the songs, the homophobic jokes – I’m watching a film of my own youth when I could be amazed by something so un-amazing. This may be the first time I’ve told anyone about my fondness for this film, outside my wife. It feels good to get it off my chest. Of course, the film is so bad it’s not even out of DVD so chances are slim I’ll get to show my girls anytime soon. Until then I will thrill to watching them experience their own discoveries, watch the magic in their eyes as they take in a world on screen that is wholly real to them. My daughter Molly saw her first movie in a theater on her second birthday. I had wanted it to be something special and I told my wife I would wait until she was ten if I had to; for her to be ready and for the right film to come along. She was ready. Freakish attention span, this girl. I found a screening on her birthday, which also coincided with Father’s Day that year, of The Wizard of Oz. She sat in rapt attention the whole time, believing everything. And for that moment, while I sat watching her face as much as the screen, I believed again in the power of the movies. No guilt involved. Eric Beetner is an award-winning short story and screenwriter. His film, Taking Your Life, is a festival award-winner and nothing to feel guilty about. He is also co-author of the novels One Too Many Blows To The Head and Borrowed Trouble, along with JB Kohl. His short stories have appeared in many online publications and the anthologies Discount Noir, Murder In The Wind and several upcoming collections. For the first time since GP started, I have to say WTF? ?